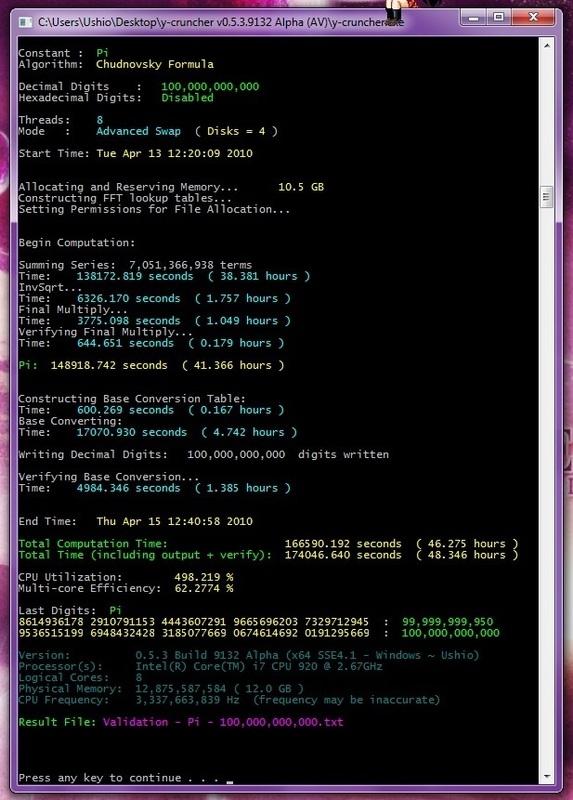 y-cruncher is a number-crunching program that can compute trillions of digits Pi and other mathematical constants. As of May 2010, y-cruncher holds the world record for the most digits ever computed of several of these constants. Benchmark Validation: for competitive benchmarking and overclocking. Stress Testing: for overclocking and computer enthusiasts. Multi-threading: to utilize multi-core processors. Disk Management: to enable large computations that would otherwise not be possible in ram. Multi-Hard Drive: to enable the use to multiple hard drives to improve the efficiency of disk computations. Fault-Tolerance: to enable the program to detect and correct for minor computation errors that may result from unstable hardware. y-cruncher BBP is a miniature side-project to y-cruncher - Multi-Threaded Pi-Program. 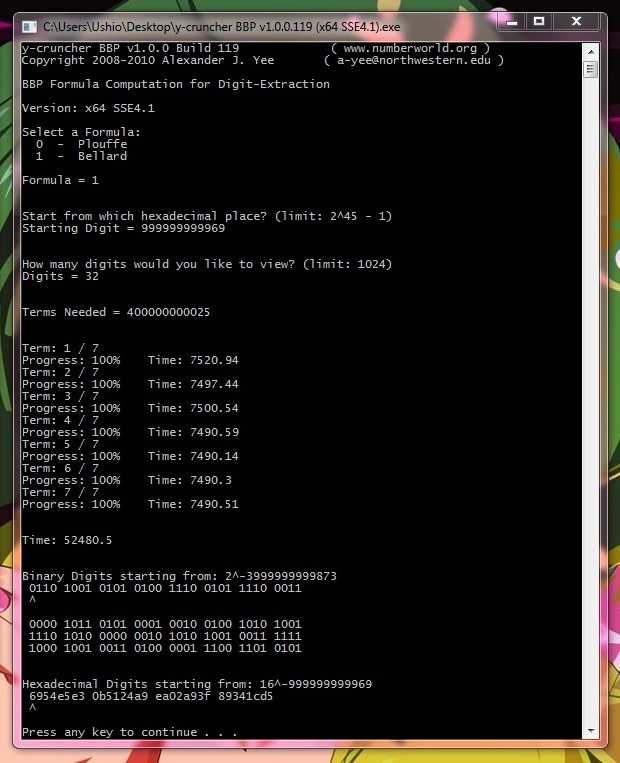 As its name suggests it implements the BBP digit-extraction algorithm for computing binary and hexadecimal digits of Pi. The original version of y-cruncher BBP was written in April 2010 for the sole purpose of verifying the world record of 5 trillion digits of Pi (August 2010). This first version has served its purpose and is no longer maintained. It has been superseded with an improved version that is now integrated into y-cruncher itself. This is the original version that is no longer maintained. Version 2.0 is a complete rewrite of the program. It uses y-cruncher's support libraries and has been integrated into y-cruncher itself. Unfortunately, it was still a work-in-progress when y-cruncher v0.6.7 was frozen for final Q/A testing. So it will appear in v0.6.8 instead. For now, it only exists in developer and private-beta versions of y-cruncher. Version 2.0: (y-cruncher v0.6.7.9456) - All times in seconds.